Have you ever wondered about the relationship between Thomas Jefferson and his slave Sally Hemings? Kimberly Brubaker Bradley’s book of historic fiction, “Jefferson’s Sons: A Founding Father’s Secret Children” (Dial 2011) is the most insightful account of slavery and life at “Master” Jefferson’s estate, Monticello, that I’ve yet to encounter. The story is told in the voice of the first son, Beverly, changes to the second son Madison and then moves to another slave, Peter. It tells the story of Master Jefferson living in the big house and Mama (Sally Hemings) and their children who live in the choice slave quarter, Mulberry Row. Sally Hemings gets the best for her children and she assures them (and us, the reader) that this is not altogether slavery. Slavery is a runaway slave being whipped once he’s caught. Mama makes her young children watch such a whipping so they understand the privilege under which they live. Are the children recognized as the Master’s children? In ways. 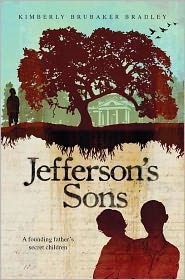 Jefferson gives the oldest son, Beverly, a violin to play and each of the boys learns to play it. Two of them are good players, and in time there will be another violin. But for the most part, the children are an embarrassing secret—a secret that everyone on the plantation knows, yet it is unspoken. These are Jefferson’s invisible children. Mama is promised freedom for her children when they each turn 21. Three are so fair-skinned, they plan to “pass” or enter into white society. What does one have to do in order to pass? Give up one’s past entirely. Keep the secret of who they are and absolutely never tell a soul, never look back, and never visit their people who are black slaves. Mama pushes her children who can “pass” to observe, learn, and enact the manners of white society. It’s essential for their future lives and for keeping their secret. What does it mean that Thomas Jefferson famously wrote, in the Declaration of Independence, “all men are created equal.” Yet he keeps slaves. Every night Mama beds with the master, yet she is his slave. Find out more at http://www.monticello.org/ where the author did a good deal of her research. At the end she describes how she used this resource, what is fact, what is her speculation. Lost myself in that review. For a moment I forgot it was a review, and was surprised when it ended. I’m hoping that book/book on tape will be at CPL. Great, Doro. Should be at Champaign Public Library, Doro. That’s where I got it. javi solanesvaya!.. junto a perez, byrne y roitma jr, davis es uno de los grandes pero ese es clint?.. e tenido que leerme los bocadillos para ver si habian cambiado a ojo de halcon.. vaya fallo davis ..vaya fallo.. a ver si le ponen la mascara ya, que eso de imitar tanto a holliwood me esta mosqueando un poko..